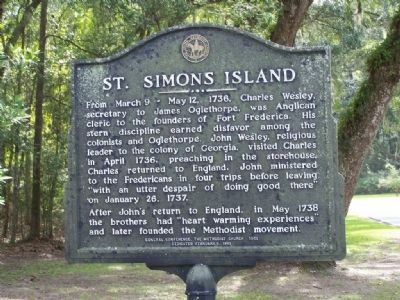 From March 9 - May 12, 1738, Charles Wesley, secretary to James Oglethorpe, was Anglican cleric to the founders of Fort Frederica. His stern discipline earned disfavor among the colonists and Oglethorpe. John Wesley, religious leaders of the colony of Georgia, visited Charles in April 1736, preaching in the storehouse. Charles returned to England. John ministered to the Fredericans in four trips before leaving "with utter despair of doing good there" on January 26, 1737. After John`s return to England, in May 1738 the brothers had "heart warming experiences" and later founded the Methodist movement. Erected 1993 by General Conference, The Methodist Church 1960. Location. 31° 13.338′ N, 81° 23.202′ W. Marker is in St. Simons Island, Georgia, in Glynn County. Touch for map. Opposite Fort Frederica entrance. Marker is at or near this postal address: 200 Block Mimosa Dr, Saint Simons Island GA 31522, United States of America. Touch for directions. 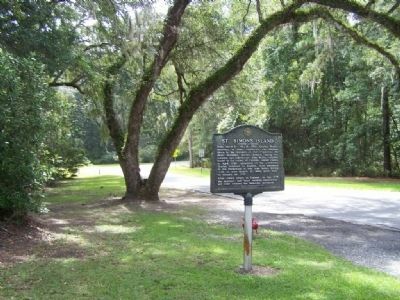 (within shouting distance of this marker); Frederica - Military Road (about 700 feet away, measured in a direct line); Frederica - Old Burial Ground (about 800 feet away); Christ Episcopal Church (approx. 0.2 miles away); Strong Walls From Refuse (approx. 0.2 miles away); The Wesley Oak (approx. 0.2 miles away). Touch for a list and map of all markers in St. Simons Island. More. Search the internet for St. Simons Island. Credits. This page was last revised on June 16, 2016. This page originally submitted on October 6, 2008, by Mike Stroud of Bluffton, South Carolina. This page has been viewed 917 times since then and 7 times this year. Photos: 1, 2. submitted on October 6, 2008, by Mike Stroud of Bluffton, South Carolina. • Bill Pfingsten was the editor who published this page.